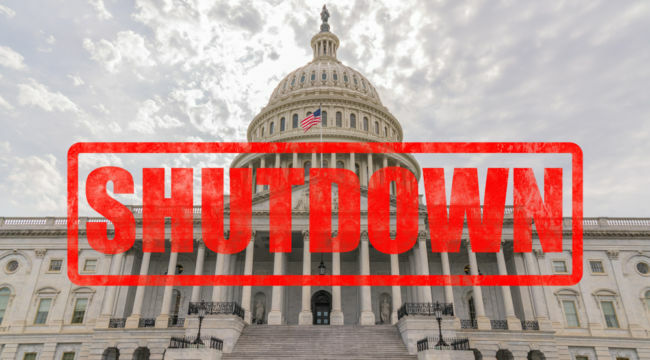 Today marks the 27th day of the government shutdown. In total, 800,000 Federal employees missed their first paychecks last week. And another 1.2 million government contractors are also estimated to be missing paychecks as well. That’s 2 million Americans currently out of work and not collecting paychecks! This boils down to a large portion of America’s middle class at risk of missing mortgage payments, student loan payments, and even spending less on necessities like food and clothing. But for some reason, Wall Street seems not to care… So what gives??? The government shutdown is definitely a frustrating experience regardless of which side of the political arguments you find yourself on. The back and forth rhetoric from both parties is exhausting. But while I don’t mean to dismiss the very real challenges that come with the government shutdown, one thing you need to realize is that as of now, Wall Street is NOT fazed by the current gridlock in Washington. In fact, since the shutdown officially began at midnight on December 22nd, the S&P 500 is higher by 8.17%! Seriously, this has been quite an impressive rebound with hardly any down days in the 15 trading days we’ve had since the market bottomed. That’s great news for investors — and hopefully you’ve been taking advantage of the sharp move higher. But this begs the question — how can stocks go higher when 2 million people are potentially now struggling to pay their bills? The key issue that Wall Street is focusing on this week is not the government shutdown… It’s not the trade war with China… And it’s not even additional interest rate hikes from the Fed. This week, we’re starting to see some of the biggest earnings reports come in — from big financial firms like the money center banks, from retail firms, from industrial companies with international customer bases, and of course from a myriad of smaller stocks that represent smaller businesses here in the U.S.
And so far they’ve been stronger than expected! Take the big banks for example. Goldman Sachs (GS) generated $6.04 per share in profit for the fourth quarter of 2018 versus the $4.45 per share estimated by Refinitiv. While Bank of America (BAC) posted earnings of $0.73 per share vs $0.63 estimated. This caused both stocks to spike after the reports were released. In addition, major airlines like United Continental (UAL) and Delta Airlines (DAL) also reported blowout 4th quarters in the face of a stock market pullback. United’s revenue for each passenger it flies a mile, a key industry metric, rose 5 percent from 4Q 2017 and Delta’s revenue per mile rose by 3.2 percent. This is the real reason why stocks are moving higher during such an unfortunate time. Trust me, I feel for those 2 million employees that haven’t collected a paycheck since the government shutdown started. But in the long run, stock prices are determined by earnings. And this strong first week of earnings season far outweighs any temporary negatives that come with a government shutdown. That’s why even as this government shutdown rolls on, I recommend that if you have the extra funds to spare, you continue allocating money towards stocks. Plenty are still on sale after the volatile last few months. And as earnings season continues, the market should respond positively to strong and growing earnings from our healthy corporations. Here’s to growing and protecting your wealth!